On your first visit, one of our experienced staff members will take you through a comprehensive gym tour to make you feel at home. Get in touch with us to know more! On your first visit, one of our experienced staff members will take you through a comprehensive gym tour to make you feel at home. We cover everything from proper gym etiquette to correct falling technique to make sure you're comfortable taking on the task ahead of you. 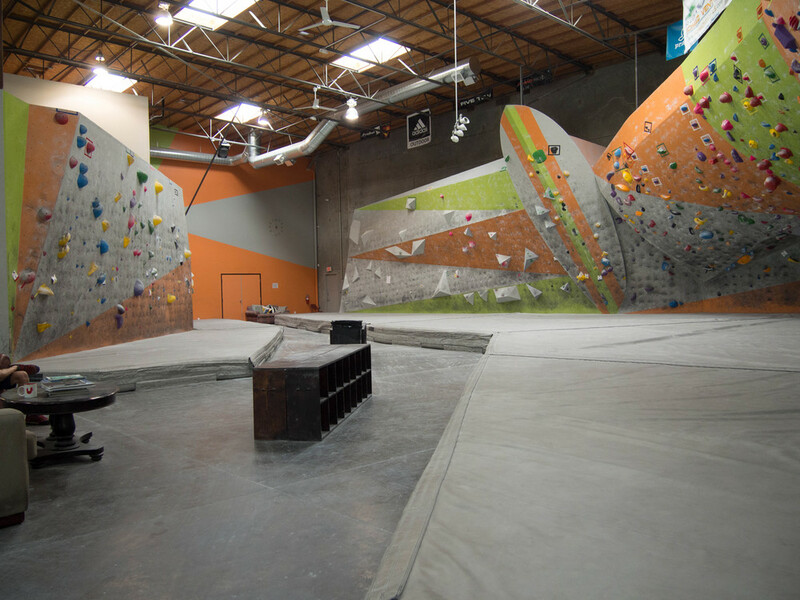 What really makes our gym special is the variety of terrain; we have 11’ slab climbing, 18’ highball boulders, a giant horizontal roof and everything in between. Routes are reset weekly by our team of routesetters to insure a continually challenging and exciting climbing experience for guests. 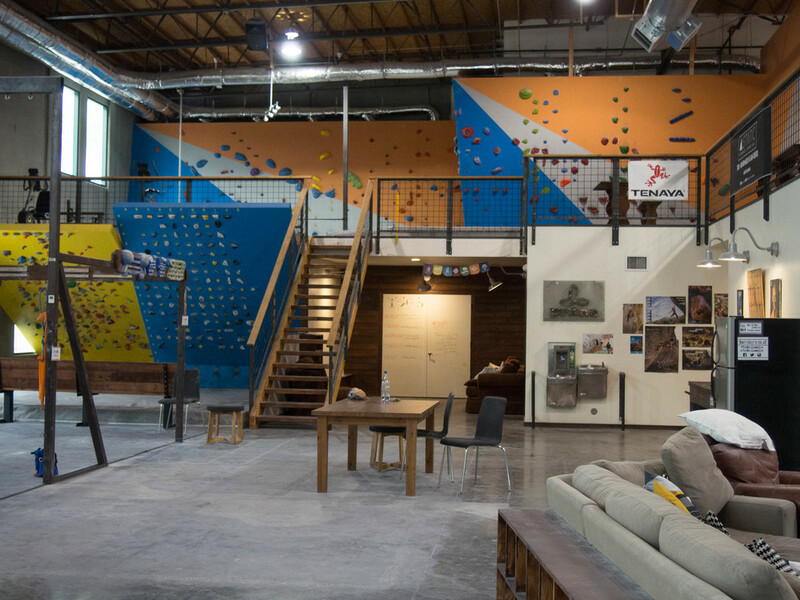 We know that not everyone is a pro climber, and we've designed our facility with this in mind. Routes range in difficulty and height to provide for climbers off all ages and skill levels. Bouldering (free climbing with no ropes or harnesses) can be a challenging sport, but our goal is to make it accessible to everyone! 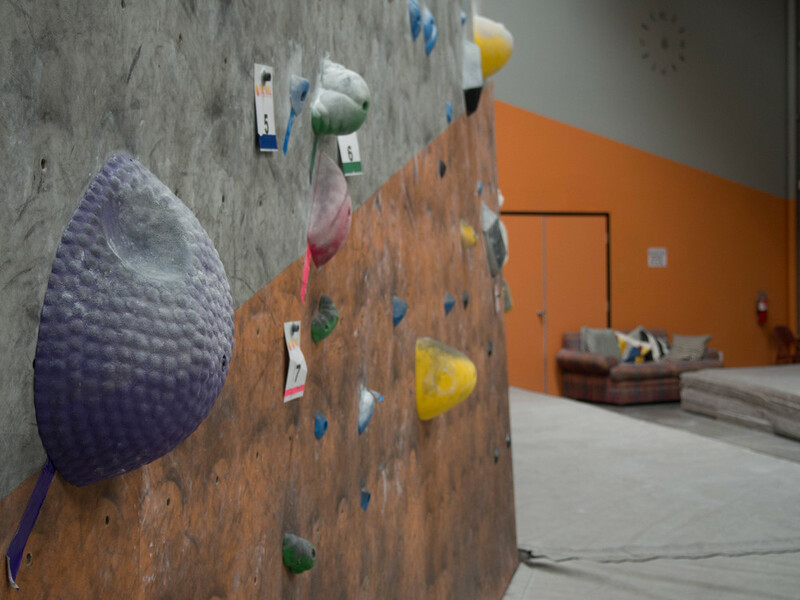 We know what it takes to push the limits of indoor bouldering and want to share it with you! Our 1,200 square foot training area is divided up into two sections, climbing specific and functional training. 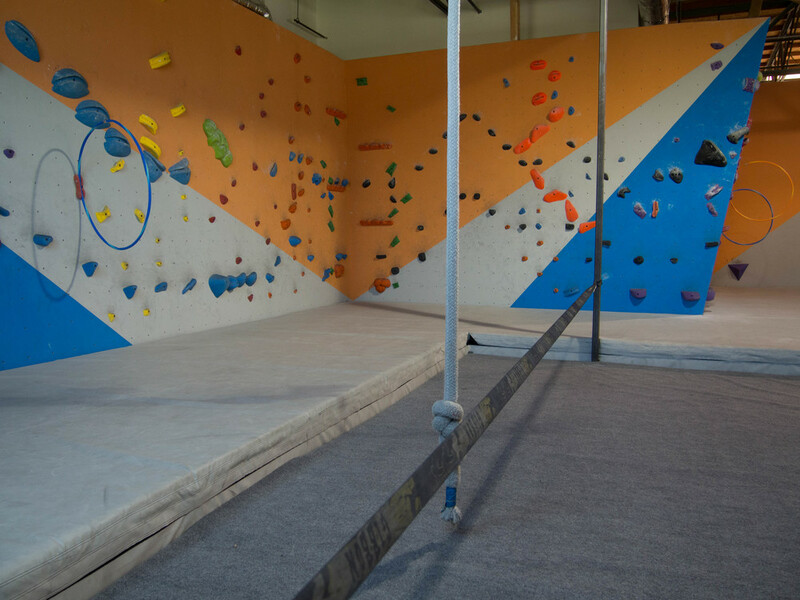 Our climbing specific area includes a campus board, 60° board, MOON board, mooring rope, and hangboards. Our training area houses custom built 12’ and 6’6” tall work out towers. These towers are designed to maximize functional conditioning for climbers. The towers have 3 different height gymnast rings and TRX bands, 3 suspension training areas, Atomic training devices and 5 different height pull up bars. We also have a full time slackline, kettle bells, medicine balls, Bosu balls, balance boards, jump boxes and a whole lot more! Don’t be afraid to ask our staff about any of the equipment. We love to spread the knowledge and stoke! We offer a variety of climbing specific training courses for all levels of climbers no matter your end goal, we want to help you reach it! Yoga at the Wall Climbing Gym is geared towards complementing your active lifestyle, and helping you to find balance throughout your day. We offer a unique, fun, and full schedule with classes ranging from thirty minutes to an hour and a half long. Weekend workshops and art shows are held regularly, offering opportunities for you to delve deeper into your practice and connect with other gym members.Our teachers are passionate, creative, and truly care. We are open to all levels and walks of life: come as you are, feel supported, and have fun! Find out more about our yoga program HERE. Our stunning 800 sq. foot yoga studio is now available for rent. This is the perfect space for an acupuncturist or a masseuse to work, or for hosting an art show or other special event. Contact Matt@TheWallClimbingGym.com for prices and availability. Bouldering can be a difficult sport to get into, but we think that everyone should be able to get off the ground. For this reason, we've created a space specifically designed to help newer climber get adjusted. Routes here reach a maximum of 11' off the pads, and many traverse from left to right as opposed to going up the wall. And our optional obstacle course traverse will challenge the strength of even the most experienced climbers. Need to get some homework done before jumping on the wall? This is the perfect place to get some studying done, and it's way more comfortable than the library! Plus we've got free WiFi! 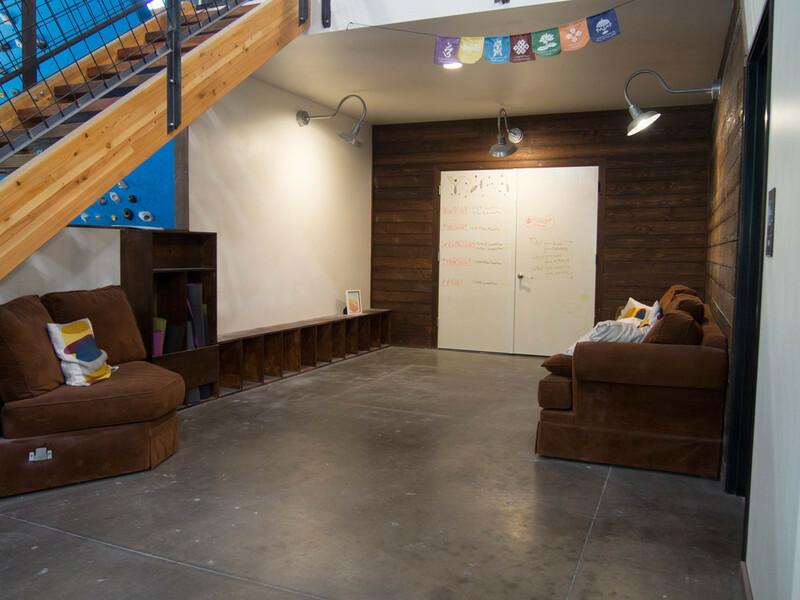 The instructional area is also available to rent for group outings or birthday parties, click here for more information! click here to see how the wall came to life!